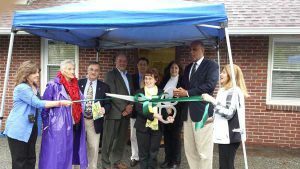 The Township of Montclair celebrated Older American’s Month with an open house and ribbon cutting to officially kick-off senior programs and activities at Edgemont Park House. The event was held on Tuesday, May 3. Edgemont Park House has seen significant upgrades, new equipment and additional staff in anticipation of its opening as a space for seniors. This was made possible with support from the Township and a grant from the Partners for Health Foundation. The Department of Recreation and Cultural Affairs and Department of Health and Human Services collaborated through the Lifelong Montclair initiative to provide senior residents in Montclair with a place to gather, socialize and relax with their peers, and participate in a wide variety of educational and recreational activities in a beautiful park setting. Edgemont Park House will be open Monday through Friday, between the hours of 9:00 a.m. and 3:00 p.m. for classes and walk-in activities. Opportunities will be available for both group activities and individual interests. Seniors will have reading materials, games, TV and a Wii system available for their use. Organized activities have been planned, including monthly movies, a quilting club, book clubs, walking groups, health screenings and others. See the Edgemont Park House calendar of events for more information and how to register for classes, or call (973) 509-4915 for more information.